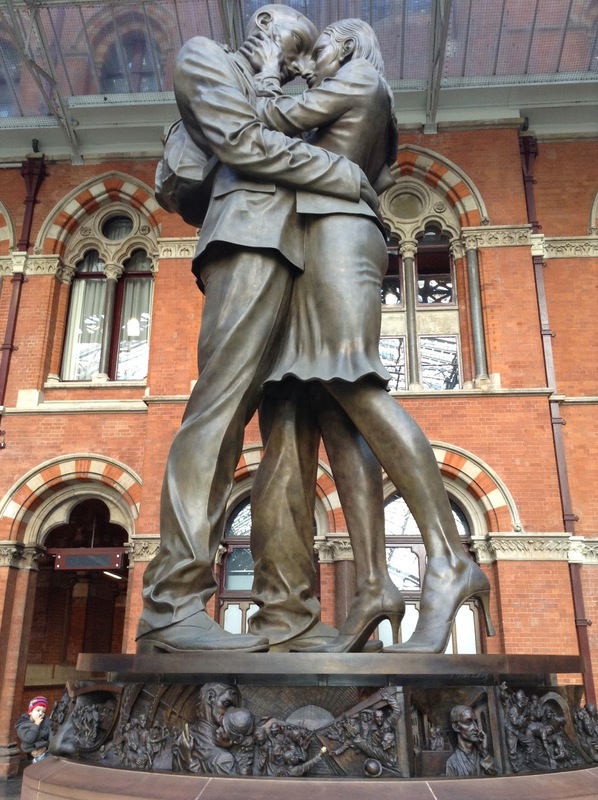 One (idea) was the embracing couple under a clock at a railway station; something that can be universally recognised as a symbol of travel is the couple being reunited. The clock becomes a moon at night. There is a sense of reunification. That had the romantic element. The figures themselves, I wanted them to be outside of race and outside of time. I'm not sure I can convince myself the figures are outside of race, but never mind. They're certainly not outside of time - fashion being what it is, that's just impossible. Imagine them in Edwardian costume and you'll see what I mean. And how many women dress like that now? These two are definitely of the 20th century and something about them - maybe it's the plinth - makes me think more of separation than reunification. They seem so closely associated with all those iconic images of soldiers going off to war. Will he ever return? At the moment of the kiss, there is hope of course, but also fear. That's why the sculpture initially struck me as more serious than the artist perhaps intended. After I read Day's interview, the male and female figures had a tendency to remind me of the stereotypical Him & Her you get on the top of wedding cakes or on musical boxes. I can understand people not being happy with something that big and that chintzy, whereas a memorial to the impact of politics and warfare on romance... I still like it okay, but I prefer my version and really, I like the plinth best of all.